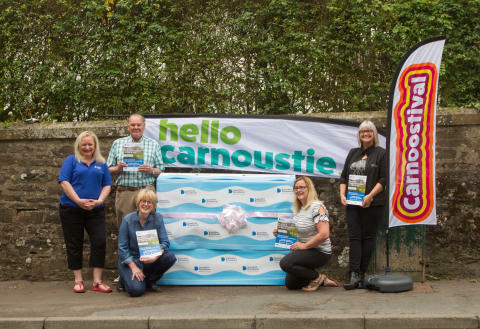 As the town gets ready to host The Open this week and enjoys 'Carnoustival' , the Digital Scotland team celebrated fibre availability in Carnoustie as they visited a fibre street cabinet that serves part of the local area. They were joined by Councillor Ron Sturrock, Suzi Caesar and Pauline Lockhart from Carnoustie Community Development Trust and Kirsty Macari (Angus Council’s economic development officer). Premises in Carnoustie are amoung 890,000 homes and businesses across Scotland which are now able to access fibre broadband through the Digital Scotland rollout. Other areas in Angus to benefit from the Digital Scotland rollout, led by the Scottish Government, include parts Tealing, Hillside, Brechin and Arbroath. More local coverage will follow as engineers from Openreach – Scotland’s digital network business – continue work on the ground. Sara Budge, Programme Director for Digital Scotland Superfast Broadband, said: “It’s fantastic news that the programme has been able to benefit residents and businesses in and around Carnoustie. Robert Thorburn, Openreach fibre partnership director for Scotland, said: “Thousands of people and businesses across Angus now have the opportunity to access their best-ever broadband speeds when they sign up with a service provider.